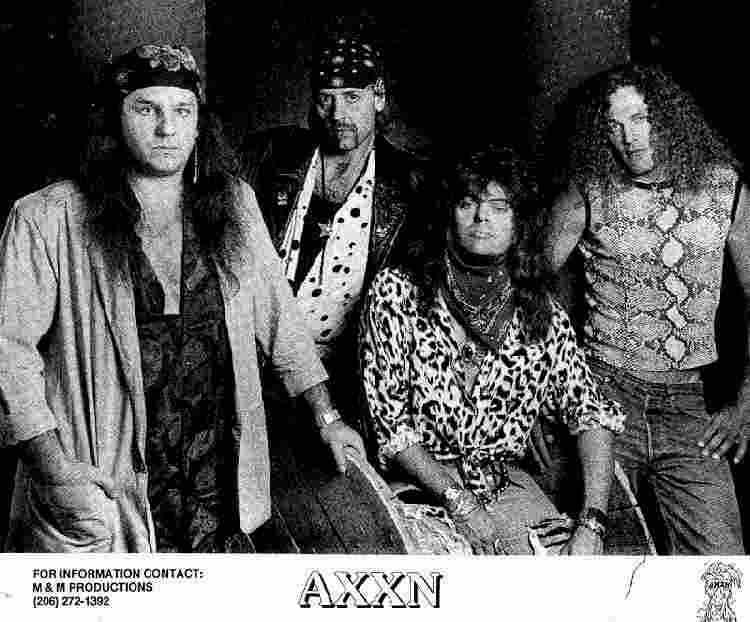 AXXN recorded an album at Seattle's Ironwood Studios produced by former Bighorn/ Allies drummer Stevie Adamek at the controls. We printed 1500 copies and sold 'em all quick. We were receiving a little airplay on KISW's Local Licks program which helped. We were very popular at Seattle's Ballard Firehouse, The Off Ramp, The New World, and Tacoma's Red Roof Pub. We had the pleasure of sharing the stage with a variety of touring acts like The Romantics, Rick Derringer, Survivor, Ricky Medlocke's Blackfoot, etc and opening for L.A. Guns and Candlebox. In '91 we were chosen to go to Japan with the Bullet Boys, (Smooth Up in Ya) as their opening act, and were in negotiations with Sony Japan to release our album, and when we were three weeks from departure, the Bullet Boys broke up (again) and the whole thing got scratched! I was crushed because the legendary Budokan was on the itinerary! During mid '90 Charlie Peterson departed, and we imported bassist Jade B. Boston from Dayton Ohio. He was awesome, and a great dude to hang out with. The Bullet Boys disappointment seemed to be the final straw, and Jade sold his gear and flew back to Ohio, and that kinda signaled the end. We gave it a hell of a go, though! John Pitcher moved to Florida, Danny White died an early death in 2001, and Charlie Peterson I believe is somewhere around Kitsap County. Buzz Brown is on Bainbridge Island restoring classic muscle cars, custom painting, and searching for that next gig. Some of the other Pacific Northwest music groups represented in this band include: The Sunrise Band, Tarnished and many other NW bands.